In the infamous words of Coco Chanel, “A girl should be two things: classy and fabulous.” And I couldn’t agree more. But what does classy and fabulous look like for the stay at home mom with a few young children? What does classy and fabulous look like for the mom whose days are filled with diapers, spit up, breast or bottle feeding, baby food, stepped on Cheerios, and mountains of laundry? I’ll let you in on a little secret. Being classy and fabulous is 90% your own mindset and 10% action. Let’s dive into the topic so that I can explain exactly what I mean! What Does It Mean To Be Classy? The Merriam-Webster Dictionary defines classy as: a : elegant, stylish b : having or reflecting high standards of personal behavior c : admirably skillful and graceful. So let’s think about this. Elegance, style, high standards for personal behavior, skillful and graceful. All of these words describe a state of mind. Now it’s true, some of these words conjure up a physical appearance, but there has to be a mindset behind the appearance. I bet if you think hard enough, you can think of a person you know in your life, or at least a celebrity who, on the outside has it all together, but her carriage, manners, and poise are sadly lacking. Now, I don’t want us to start focusing on other people, we are focusing on ourselves here. Even though I have nine children, three of those children are four and under, so I am very much still in this stage of life. So, let’s brainstorm a few things that we can do to help ourselves FEEL classy in our everyday lives. –Quick Beauty Routine in the morning (doesn’t have to be full makeup, just enough to help you feel pretty and polished). -A transfer resistant, long-wear lipstick. Put it on in the morning after you brush your teeth, look glamorous all day long! -Good posture. Have you ever seen an elegant woman slouching? Me either! Keep your shoulders back and stand as though there were a string attached to your head pulling you up. -A smile. Audrey Hepburn said, “Happy girls are prettiest.” I know it’s hard when you are changing your fifth dirty diaper of the day, or when the baby spits up in your hair, but smile. Smile at your babies. When they smile back, you’ll feel so much better! You’ll look better too. -A pair of earrings. Earrings are so quick, and they upgrade your look and mood immediately. -A grateful heart. Complaining and being discontent with your circumstances is not classy. If you don’t like the way things are, then make a change. But complaining never fixed anything. If it’s any overload of housework, check out a few of my posts on laundry, decluttering, housekeeping, and children’s chores. If you need help being a more proactive parent, I’ve got help for you there too. All of these things will give your physical appearance a boost. But the most important thing is how they will make you FEEL. If doing these things only makes you feel more tired, then they are not for you. But, if you get a mental boost of confidence from any of these things, that is what you are shooting for! It’s the confidence that makes you classy. In order to be fabulous, you have to first feel classy and confident. So if you’re not feeling it yet, go back up to the classy section, and try a few more of the suggestions until you get there. Merriam Webster defines fabulous as: wonderful, marvelous. Fabulous truly is a state of mind. And you know, some days will just not be fabulous days, and that’s okay. But every day has the potential to be fabulous, but only if you make it so! For me, being fabulous means going the extra mile if I have the energy and the time. And to be honest, sometimes you just have to make the time for it. Being fabulous can be the gift that keeps on giving. One of the things that I do to feel fabulous is doing my best to keep my nails painted. I’m not perfect about this, sometimes they go unpolished. But painted nails gives me a HUGE mental boost. I can look at the pureed peas smeared on my shirt, the clutter pile that I’ve left too long, the sweet baby handprints on the newly washed window and feel like perhaps life is getting out of control. But then, I can look down at my pretty fingernails, and I kid you not, I get a second wind, and go take care of the things that seemed too out of control. The fabulous parts of your life won’t always happen daily, especially when you have a bunch of little people who need so much time and attention. But just because you don’t have time for a daily dose of fabulous doesn’t mean you should forget about it altogether. A small dose of fabulous may be just what your day needs. Make time for a little bit of fabulous and see how it affects the rest of your day! 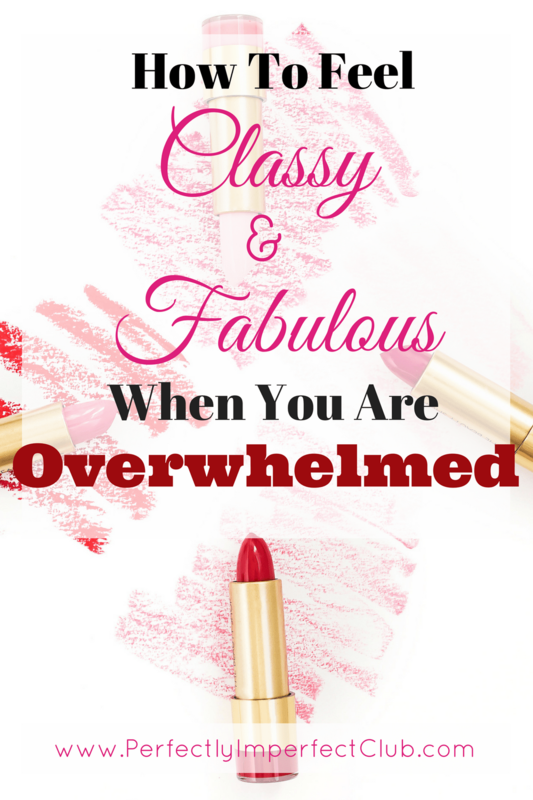 The things that make me feel classy and fabulous may not be the same for you. I have an outgoing personality. That doesn’t mean that shy or reserved ladies cannot be fabulous. We are all unique and special. So it’s up to you to figure out what make you light up and shine. Highlight your own beauty. Highlight your own personality! 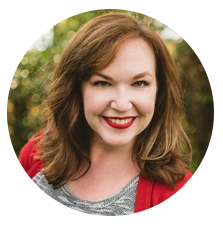 I have a FREE four day course that can get you started if you have gotten into the habit of not doing anything to make yourself feel classy and fabulous. I’d love to share with you. Just fill out the form below, and you will be well on your way! Ashley Buffa is a participant in the Amazon Services LLC Associates Program, an affiliate advertising program designed to provide a means for sites to earn advertising fees by advertising and linking to www.amazon.com.